This is a gift for the second of my recommendation letter writers. Since the recipient is a guy, I wanted to make a hat and I had the perfect color in stash, a deep chocolate brown. 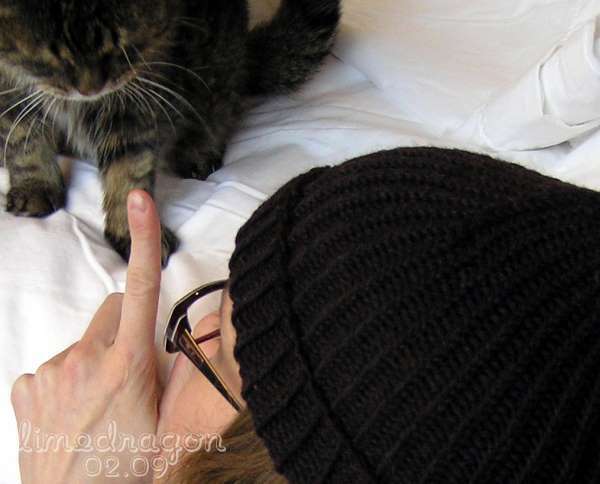 In the last photo, it looks like I’m scolding Munchkin. When she was a kitten, Mom created a bad (in my opinion) habit by allowing her to play with and bite people’s fingers. So she’s actually about to pounce. 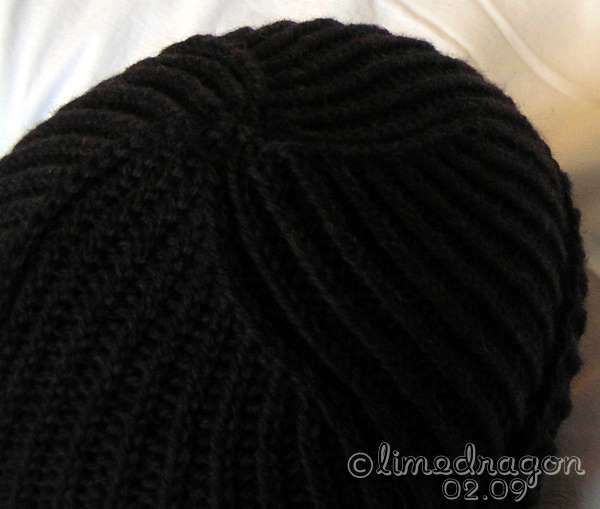 Pattern: �The Marsan Watchcap� by Staceyjoy Elkin, RedLipstick.net Size: Men�s Medium Yarn: Cascade 220 Heather, 4006 Galaxy 0.6 skein Needles: Various Brands US 7 (4.5 mm) circulars Started: March 4, 2009 Completed: March 5, 2009 Ravel this project! The hat looks black to me! That is a bad habit. Bad Mom. No biscuit. Good thing Munchkin’s so cute! The hat looks very dark brown. And guys in my opinioin are hard to give a gift to. Especially colors. I kind of like the pattern where the spiral is very defined. Ha…Munchkin was cute! All kittens were cute when they were little. Love the kitty shot! :) So cute. one of my cats bites when he’s had too much petting time. he also bites if you don’t feed him quickly enough. it’s been a real battle getting him to stop. any tips?